These news items come from our Facebookpage. It's time to discover everything that's new from Mediterranean ScicSailing! 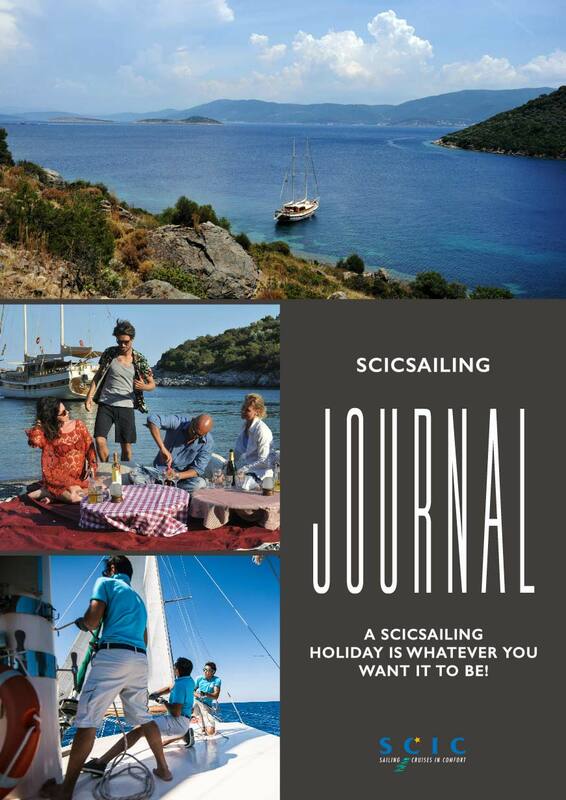 ScicSailing offers endless possibilities for your sailing cruise this year. Take a look in the enclosed Journal, just click on the image. Another couple has booked for 2020. They will be celebrating their wedding anniversary with all the family. They are not the first to celebrate such a special moment in their lives this way. What could be better?! Would anyone else like to sail along the Turkish and/or the Greek coast? The rental cost is all-inclusive. Our first guests are on board. We are looking forward to another great sailing season with many beautiful memories. Alert for visitors to Bodrum, Dalaman and Turkey! Please check in at your departure airport with printed proof of your visa to enter Turkey. Either a visa stamp or a printed copy of your tourist e-visa. People have been barred from boarding their flight without this proof. In Turkey it is often very warm in the evenings! No worries, drinks are included (coffee, tea, mineral water, soft drinks, fruit juices, wine, beer, raki and selected spirits, including gin and vodka). One more week then we start again! On April 6 our first guests come on board. We are certainly looking forward to it. Hopefully, you are too! The captains are about to go on a wonderful trial sail. There she goes ... She has had to wait a long time for it, but now she can finally return to the seas. For the individual sailing cruise on 22 June, with departure and arrival from Goçek, only 2 cabins are now available. Take your chance, as it's a route that we rarely sail! What makes this route so special? The opportunity to visit Kas, Kalkan, Patara, Letoon,or Xanthos! Whilst our yachts are still on dry ground for maintenance, our reservations have now doubled compared to last year! Have you always wanted to go snorkeling or do you feel like doing it again? On the 15th of June we depart from Marmaris and sail to Goçek, with amongst others a visit to Caunos and a beautiful bay with underwater ruins. It's a top spot for snorkeling! In recent weeks, a number of themed trips have been mentioned, but we offer others. The themed sailing cruises last 1 week, from Saturday to Saturday. Just enjoy it, in a week where nothing has to be done, with a topic that interests you. Turkey offers more than just beautiful deserted bays. It has a rich #history, beautiful #landscapes and an ancient #culture. Along our sailing routes much of this beauty and history can be seen and experienced! We are therefore offering the themed trips- 'IN THE FOOTSTEP OF THE GREEKS' and 'LOOKING FOR THE ANTIQUE TURKEY', so that you can enjoy not only the water, but also the rich history along the coastline. What might not be known... it is possible to request a bespoke excursion. You do not necessarily have to choose a themed trip here. It can be booked in advance or whilst you are on the cruise. Ask the captain what special place (s) there are to discover along the itinerary. Last year, a group of friends sailed with us on a private yacht charter/exclusive charter with crew. Does this appeal to you too? Mail info@scicsailing.eu for more info. De jaarlijkse zeilrace waar zo’n 70 klassieke zeiljachten aan deelnemen start op 21 oktober. Voor onze passagiers is er de kans mee te strijden om de Bodrum Cup te winnen! We have given our love to these delightful little puppies. After a workshop with our captains & crew, we went bowling. Afterwards we brought some food to the dog&cat shelter for the Bodrum municipality. Every year we organize many themed trips for our guests. The themes often arise because they were asked for quite often over the years or else what we felt might appeal to you. Maybe you have other themes in mind that we can offer? We are curious to know what theme you REALLY find a good match with ScicSailing! Is it a theme that we already provide or do you have another idea? Would you like to create food as delicious as on the boats? Chef Ahmet Çetin, a representative of the delights of Turkish cuisine in culinary competitions around the world will send you home at the end of the week with the ability to create mouthwatering Turkish meals! Departure date: May 4. The ScicSailing crews are not only busy with the winter maintenance of the yachts, but are also polishing their personal development skills. Some of the courses are organised by the Mugla Sıtkı Kocman University, leading to a certificate in the 'Management of guest relationship'. About 50% of our passengers are single travelers. In general, we can get a good mixed group together with several singles or maybe a couple of friends travelling together. There are special ‘singles weeks’ on April 20, May 11, June 8, July 13, August 17 and 31, September 28. All our planning is dependant on the Reservations for a specific date. So cool ... A 70-year-old lady who sailed with us 11 years ago is joining us again to enjoy one of our sailing cruises.